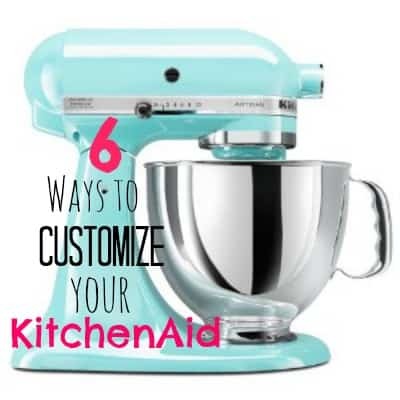 6 Ways to Customize Your KitchenAid Mixer… +WIN One!! I’ve been a long time KitchenAid Stand Mixer owner, I LOVE it, I can’t imagine some recipes without it! If you don’t have one and you spend lots of time in the kitchen I’m sure you long for one. But what are you to do with this beauty once you have it in your arms? Customize it of course (some would say use it to cook, but this case it is beauty before belly)! Today I’ve rounded up the top 6 ways to customize your KitchenAid mixer to be the star of your kitchen. +PLUS…I’m VERY excited to share with you that I’ve partnered with some fun and awesome bloggers to GIVE one away!! 2. 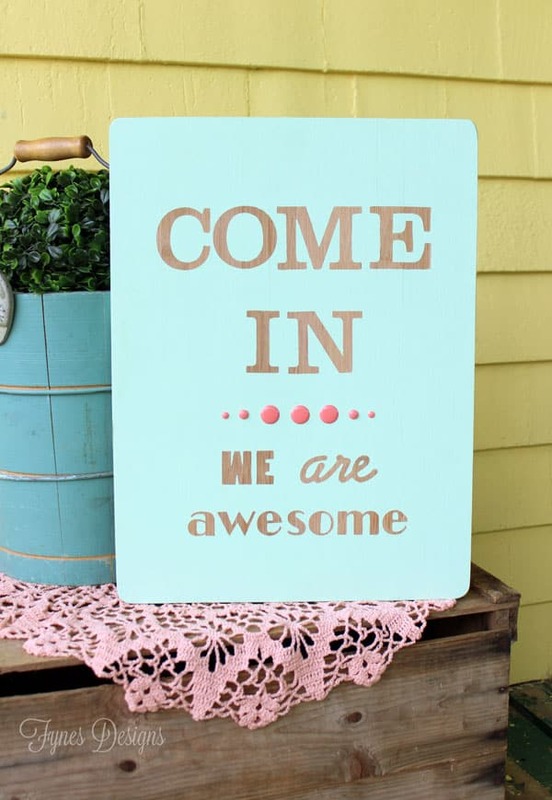 Paint– Still kickin’ it old school? If so, you probably have your hands on the power house of mixers (don’t let it go) paint is a great way to get the modern color you’re looking for. You Craft Me Up! has a great tutorial how to dismantle your Mixer and get that color you desire! 3. Bedazzle– This idea might be a bit over the top (especially the price tag of 2 Grand!) If unique is what you’re wanting, look no further than Bling Diva Designs, where you can get a custom Mixer -covered from top to bottom is Swarovski Crystals. 4. Paintable Clings- Martha Stewart and Plaid have a line of paintable clings that make remodling your mixer as easy as pie! These Clings are so easy to use (as you’ll see in Cheap Art Week tutorial), reposition-able, and are easy on the pocket-book. Definitely the simplest option, see 52 Mantels Jazzed Up Mixer. 5. Custom Ink– Un Amore Custom Designs has taken personalize to a whole new level, you can have Nicole Dinardo custom paint a mixer to suit your taste. The sky is the limit with this idea, patterns, floral, pin-ups, nature, architecture, the list goes on. This is one gallery you have to click-through! 6. Cover it– You may love your mixer but the fact is they do get dusty. A fabric cover is a great way add a little personal touch and a trendy pattern,without dragging out the paint equipment. Check out Homemade by Jill to see the details of hers. Hope you liked this little roundup of ways to Customize your mixer. I’m keeping my fingers crossed for you to win! Do you love to cook? Do you know someone who loves to cook? Do you just want something pretty in your kitchen so that people think that you know how to cook? Regardless of the category you fall into… you’ll want this beautiful KitchenAid Mixer! I’ve partnered with some fun and awesome bloggers, just follow along on their social media, and one of you will WIN an awesome KitchenAid mixer! I love my Kitchen Aid Mixer. My three kids have grown up watching me use my red one. For Christmas this year two out of my three kids asked me for a mixer of their own. My 27 year old son living in Arizona and my 23 year old daughter living in Georgia both asked for mixers for Christmas. I was so pleased and yes of course Santa brought each of them one. I was going to ask if this was open to Canadians but I see that it is! Found some great new blogs. Thanks for sharing. New follower of yours on Pinterest (http://pinterest.com/journeyofthezoo), Facebook (http://www.facebook.com/JourneysofTheZoo2) and Google+ (https://plus.google.com/117146120519608211142/posts). I hope you’ll stop by The Zoo for a laugh and to win some giveaways for yourself. What? This is too cute! I had never even thought of customizing my Kitchen Aid! These are great ideas and I am seriously tempted by that dust cover! My birthday was April 1st & my Husband bought me a kitchen aid with a Groupon deal. I AM SOOO EXCITED!!!! The only “downfall” is it only came in the one cream color (not that there can be ANY complaining when you have a kitchen aid no-matter the color)….enter your amazing blog post! Perfect timing, thanks for the great ideas to spice up my kitchen aid. I’ve had my white Kitchen Aid mixer for almost 40 years and I’m ready to up date and make them beautiful! I love the ease of your ideas and I absolutely love my Kitchen Aid mixer. I got a professional series one about 10 years ago and with the deal I got I wasn’t able to choose the color I wanted so now I can make it look the way I want it to. My daughter has started her hope chest and an Kitchen Aid mixer is on her wishlist. It would be great to be able to give her one. Thanks for sharing your tips! !